A great injustice has been done and I do apologize! Three savory recipes in a row?! From me - the queen of sweets?! Don't worry, I will make up for it! (I know, there are much bigger problems in the world. I just makes my heart hurt to think about them, so I think of chocolate instead.) This ding-dong cake will surely be enough for you to forgive me right? Chocolate cake, fluffy vanilla filling and a decadent chocolate top. It is one of your favorite childhood snack cakes all grown up! Ruth was my grandpa's dental assistant when I was a kid. My dad shared office space with him, so we got to see her frequently. This cake was one she made and our family fell in love with. Ruth made her cake using a chocolate cake mix, which you can totally do to. I never have cake mixes on hand anymore, so I whipped up a quick Devilishly Good Chocolate Cake. It doesn't take any more time than putting together a cake mix and it uses super simple ingredients that I always have on hand. Then all you have to do is put together a quick cream filling that is a lot like my favorite whipped cream frosting recipe, and a deliciously fudgy frosting pours over the top and drips down the side. You are going to love this cake! I brought this to a dinner at my father-in-law's house and it was a hit. Everyone loved the fudgy frosting and I think the deeper flavor of the cake really went well with the light filling. Bake and cool cakes according to the recipe/box. Whisk together cold milk and flour in a saucepan until it is combined. Cook over medium-low heat until it forms a thick paste, stirring frequently. Cool to room temperature. In your mixer cream together shortening, butter and sugar. Add cooled milk paste and beat on high for 10 minutes. Spread between cake layers. For frosting, melt together chocolate and butter. Stir in powdered sugar and vanilla. Add about 3 T of hot water, a teaspoon at a time, beating constantly until you get a consistency that is still relatively thick, but flows easily when poured. Spread over the top of the cake, allowing glaze to run down the sides. Ding Dong...this makes me Happy!!!! ha ha!! Ding Dongs have a special memory as they were my dads favorite when I was growing up, he has a birthday next month, I should surprise him with this!!! The picture alone sure made me smile!! For some reason now, every time I am deciding what to say the only think I can think of is ding dong the witch is dead! Maybe I need to go back to bed for a while! This would be a perfect birthday cake for your dad! My oven has been out of order so I haven't made anything sweet in about 2 weeks. I was about to die. I mixed up chocolate chip cookies while waiting for the repairman to come and install the new parts. I was done long before he finally arrived! So cookies were baked and everyone at the office very happy. This cake would make them exceedingly happy! Thanks for sharing. That is a long time to go without baking, I feel our pain! I am sure your coworkers are especially glad that your oven is back in working order! I hope you love the cake if you give it a try. Thanks, Linda! Yay! I hope he loves it! Oh my goodness - that looks/sounds perfect. I am a chocoholic and this is screaming "make me!!" Thanks for sharing with us at The Wednesday Showcase! You should totally make it! It is so good! Thank you! Carlee ~ This looks unbelievably delicious! I so wish that this was waiting in the kitchen for me right now! Thank you, Kris! Everyone was going nuts over the fudge frosting and how creamy the filling was! I haven't had one in forever myself, but the cake was like a taste of childhood! Thanks! love this! it reminds me so much of being a kid. I used to love ding dongs haha :) thanks for sharing! This is a perfect grown-up version! Thanks! Oh, Carlee, Carlee, Carlee - you have to stop doing this to me! By the time I get computer time it's always like 10, 11 or 12 at night - and to see this cake! Wow! Spectacular. 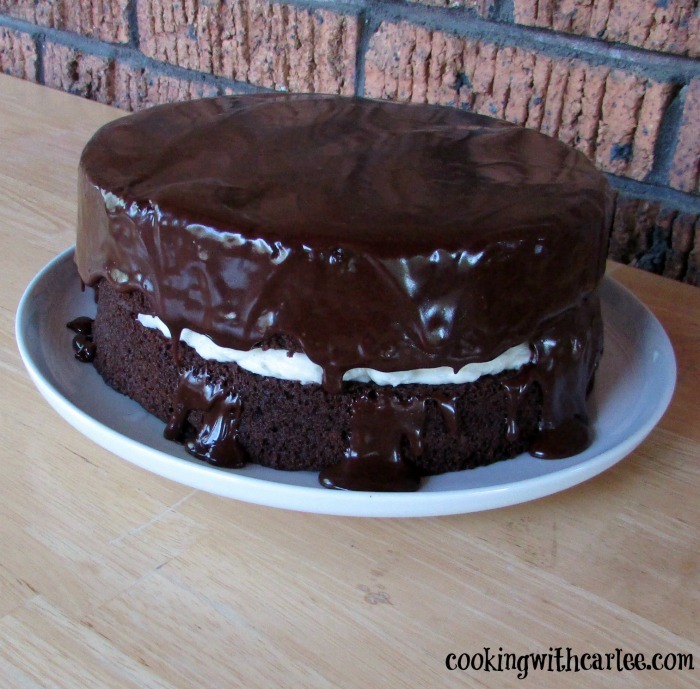 You can tell just by looking at it that it's moist and gooey and chocolate perfection! We would just love this cake it looks awesome! Hope you have a very special Fathers Day Weekend and thanks so much for sharing with Full Plate Thursday. Thank you, it is a winner that is for sure! Thanks Ali! I am glad your comments are back up and running... I've missed chatting with you! Thank you! We really love it! 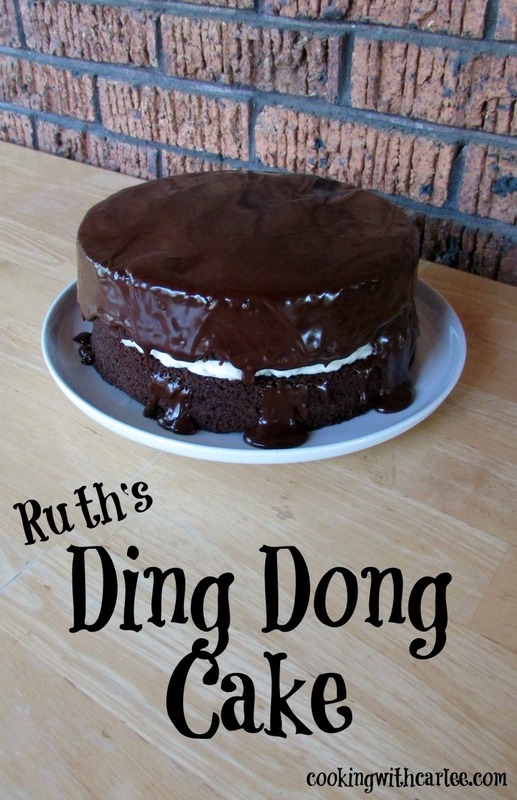 I'm not sure if I've ever had a Ding Dong cake but it sure looks good! Thanks for linking up with Funtastic Friday. Ha! Well now is your shot! ;-) Thank you! 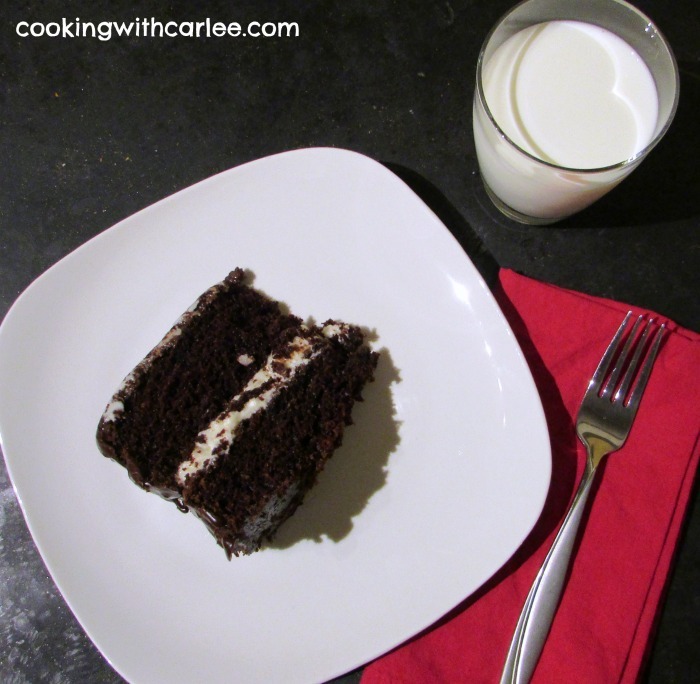 I have made the ho ho version of this cake so many times for my kids days. Looks awesome. Pinned and shared! UM, WOW!! Yum, yum. Looks amazing, pinning ;). Thanks for sharing at You Link It, We Make It, we hope to see you back tomorrow! Thank you! And sorry I'm late to the party, I'm headed over now! I've been meaning to check out this post and am happy you linked it up to the Country Fair Blog Party so I wouldn't forget. This looks so decadent! I'm glad you had your chance! Thanks, Val!